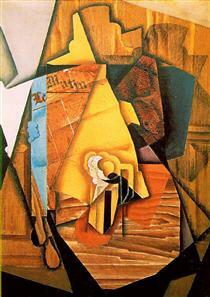 In 1906 he moved to Paris and became friends with Henri Matisse, Georges Braque and Fernand Léger. 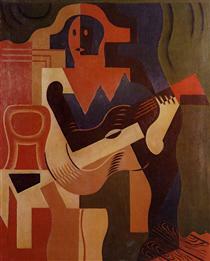 In Paris, Gris followed the lead of another friend and fellow countryman, Pablo Picasso. 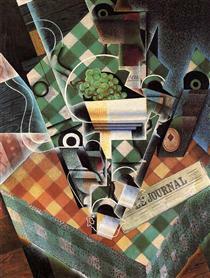 He submitted darkly humorous illustrations to journals such as the anarchist satirical magazine L'Assiette au Beurre, and also Le Rire, Le Charivari, and Le Cri de Paris. 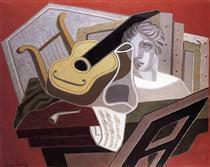 Gris began to paint seriously in 1910 (when he gave up working as a satirical cartoonist), developing at this time a personal Cubist style. 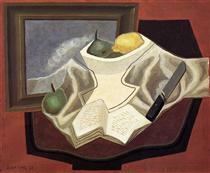 In A Life of Picasso, John Richardson writes that Jean Metzinger's 1911 work, Le goûter (Tea Time), persuaded Juan Gris of the importance of mathematics in painting. 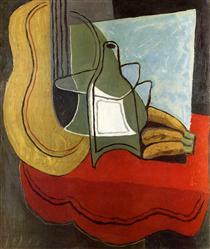 Gris exhibited for the first time at the 1912 Salon des Indépendants (a painting entitled Hommage à Pablo Picasso). 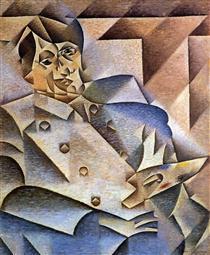 "He appears with two styles", writes art historian Peter Brooke, "In one of them a grid structure appears that is clearly reminiscent of the Goûter and of Metzinger's later work in 1912." 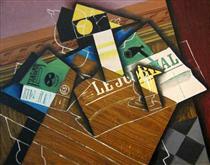 In the other, Brooke continues, "the grid is still present but the lines are not stated and their continuity is broken. 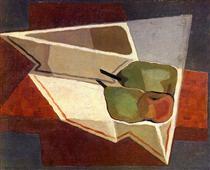 Their presence is suggested by the heavy, often triangular, shading of the angles between them... 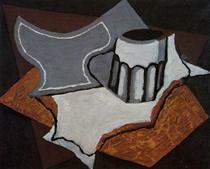 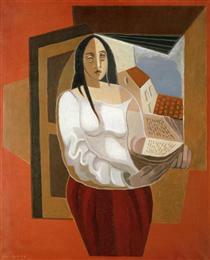 Both styles are distinguished from the work of Picasso and Braque by their clear, rational and measurable quality." 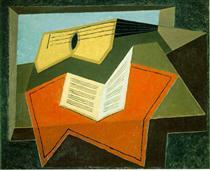 Although Gris regarded Picasso as a teacher, Gertrude Stein wrote in The Autobiography of Alice B. Toklas that "Juan Gris was the only person whom Picasso wished away". 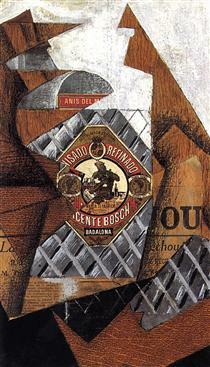 In 1912 Gris exhibited at the Exposicío d'art cubista, galeríes J. Dalmau in Barcelona; the gallery Der Sturm in Berlin; the Salon de la Société Normande de Peinture Moderne in Rouen; and the Salon de la Section d'Or in Paris. 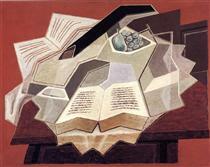 Gris, in that same year, signed a contract that gave D.-H. Kahnweiler exclusive rights to his work. 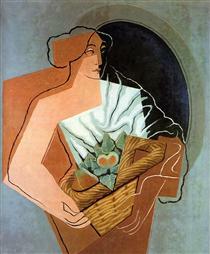 At first Gris painted in the style of Analytical Cubism, a term he himself later coined, but after 1913 he began his conversion to Synthetic Cubism, of which he became a steadfast interpreter, with extensive use of papier collé or, collage. 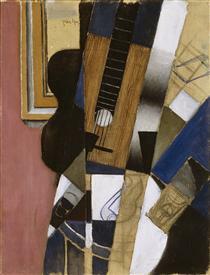 Unlike Picasso and Braque, whose Cubist works were practically monochromatic, Gris painted with bright harmonious colors in daring, novel combinations in the manner of his friend Matisse. 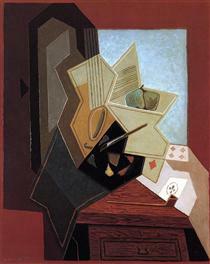 Gris exhibited with the painters of the Puteaux Group in the Salon de la Section d'Or in 1912. 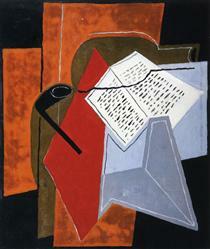 His preference for clarity and order influenced the Purist style of Amédée Ozenfant and Charles Edouard Jeanneret (Le Corbusier), and made Gris an important exemplar of the post-war "return to order" movement. 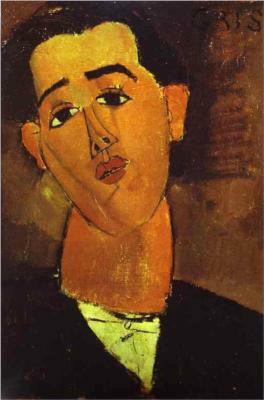 In 1915 he was painted by his friend, Amedeo Modigliani. 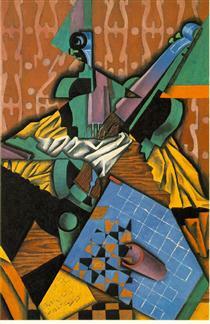 In November 1917 he made one of his few sculptures, the polychrome plaster Harlequin. 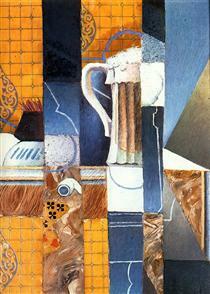 Beer Glass and Cards Juan Gris ?